UK Release Date - 2nd October 1995. US Release Date - 14th November 1995. Producer - Mike Shipley/Def Leppard. Studio - Rick Savage's House Dublin, Ireland (Track 04). Backing Vocals - Stevie Vann (Tracks 01/04). String Arrangement - Michael Kamen (Track 01). Piano - Randy Kerber (Track 01). Tracks 02/03/05/06 - The Extended Versions/Mixes from the Hysteria singles renamed. Track 04 - 1990 demo recorded at Sav's Dublin home with Steve Clark's final recorded guitar solo. UK Record Label - Bludgeon Riffola/Mercury. US Record Label - Island/Mercury. Special Formats - 2CD Single set. Part 2 in jewel case 'Z-Pack' with 6 page booklet. Special Formats - German 2CD set. Part 2 in 'Compact Plus' case with space for CD2 (no booklet). The first and only single from 'Vault Greatest Hits 1980-1995' was released in October 1995. 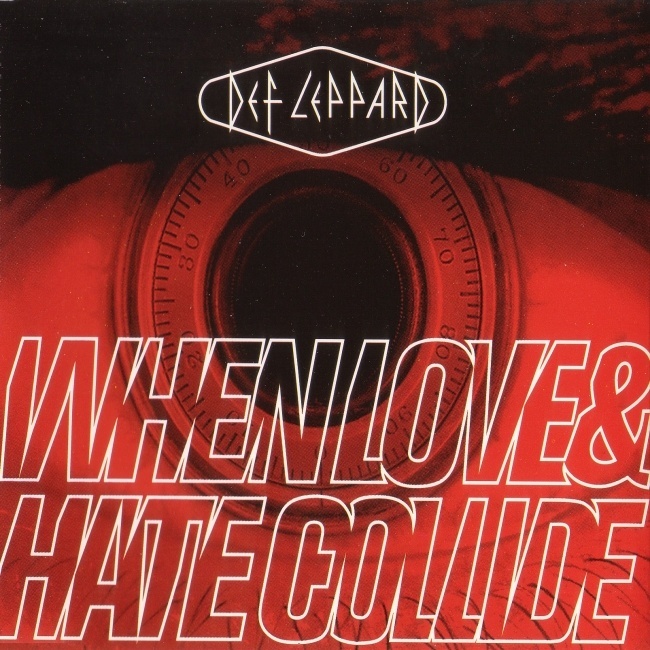 'When Love & Hate Collide' was the only single from the 'Vault' album and became the biggest UK hit of Def Leppard's career. The song stayed at Number 2 on the Top 40 chart for two weeks following two appearances on Top Of The Pops. The song dated from 1990 when a demo was recorded at Sav's house in Dublin. The demo was included on the first UK CD featuring the final guitar solo by Steve Clark. This single marked the first release on CD for many of the Extended Versions from the Hysteria singles, now retitled as Remixes. Only 'Rocket' had previously been available on a CD single. UKCD2 came in a jewel album case with 6 page picture booklet. The song was made available on iTunes as a digital download on 12th February 2013.